The process of drying peas as a form of preservation or for planting the next growing season is simple to accomplish. Much of the work of drying occurs right in the garden and the gardener's main task is pulling the plants and shelling the dry peas. The key to drying peas is to let the sunshine and air do most of the work for you. 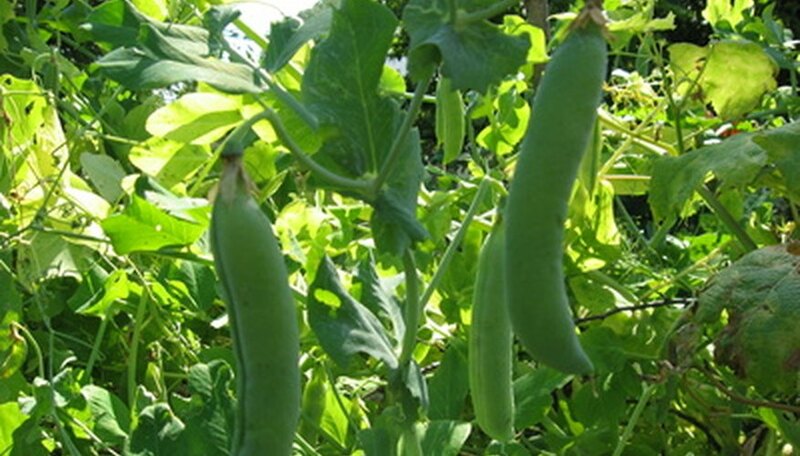 Allow the pea pods to dry on the plant in the garden. This can take 2 to 3 weeks after you have picked the last of the peas to be eaten. The pea pods will turn brown and you will be able to hear the seed rattle in the pod. Pull the entire plant from the ground and lay it on top of the dirt in the garden. Allow it to dry this way for 5 to 7 days. Alternatively, if rain is predicted, strip the pods from the plant and lay them out on newspaper in a closed area with good ventilation. Strip the pods from the plants if you dried them in the garden. This is accomplished by simply picking the individual pods from the dried plants. Split the dried pods and harvest the pea seed inside into a bowl or other container. Pea pods are simple to crack open when they are dry, simply press at the seam of the pod to split it apart. Store the dried seed in airtight jars or place in envelopes and seal. Label the jar or envelope with the pea variety and date, using a pen or marker. Expect to yield approximately 15 pounds of pea seeds from a row 100 feet in length. If rain is predicted and you cannot dry the plants in the garden, strip the pods from the plant, lay them out on newspaper in a closed area with good ventilation and allow them to dry for at least 2 weeks. If you are saving the seed for planting, you can leave the peas in the pod until time to plant, if desired.